Cancun is one of the best spots for kiteboarding in Mexico. Here you can find several places with all kinds of conditions, from flat waters to do freestyle at Isla Blanca and Playa Nizuc, to waves in the hotel zone in Playa Chac Mool and Playa Delfines. The warm waters and weather all year-round attract more and more kiters from all over the world to this city. Here you can also find lodging ranging all prices and categories. The windy season is from November to June. The winds are consistent and may vary from south to north. From November to April, it is called the “Season of the Norths”, since the winds are affected by the cold fronts from the north coming from The United States and Canada. Winds coming from the north are strong (18-25kn) and the weather can get cold, which is why a neoprene suit of 4/3mm or 5/3 mm is recommended. As soon as the wind turns to the east and southeast –which is what usually happens- you no longer need a neoprene suit as the temperature rises. From April to May, the wind is always hot, with an average of 10-20 kn. Contact us if you are interested in Kiteboarding Lessons in Cancun, rent kite equipment, kite trips and tours. Isla Blanca is an excellent spot, ideal for practicing on flat waters and taking kiteboarding classes. It is a great strip of sand, located just 25 minutes to the north of the hotel zone in Cancun inside a large and shallow salt-water lagoon. At this spot you can kiteboard risk-free due to the shallow, waveless waters, as well as practice with all wind directions. Punta Nizuc is a small strip of sand located to the south of the hotel zone, near the airport. The great coral reef located in the external area of the bay keeps the water permanently flat and without waves. The water is shallow the first 50 meters, so you can walk without trouble. There are several trees at the beach and shaded areas with palapas (thatched roof huts). The best winds for kiteboarding in Playa Nizuc are S-SE-E.
At kilometer 10th in the so-called hotel zone in Cancun, there is a beach that is ideal for the enthusiasts of kiteboarding on waves. We are talking about Chac Mool, which was given its name after the statue of Pre-Columbian data in Mesoamerica. This stone-made figure is pretty popular in the state of Yucatan and in Central Mexico. It is a large beach with white fine sands and incredible turquoise waters, a typical feature of the heavenly Cancun beaches. This popular beach faces the open sea, and it generally has heavy swell. There are several hotels near Chac Mool beach, including the Gran Caribe Real Resort and Spa, and The Royal in Cancun. If you come to Cancun for a visit, give yourself the chance to encounter the ambivalence of this quiet, yet dynamic beach. Besides, it is located right in the middle of the hotel zone. 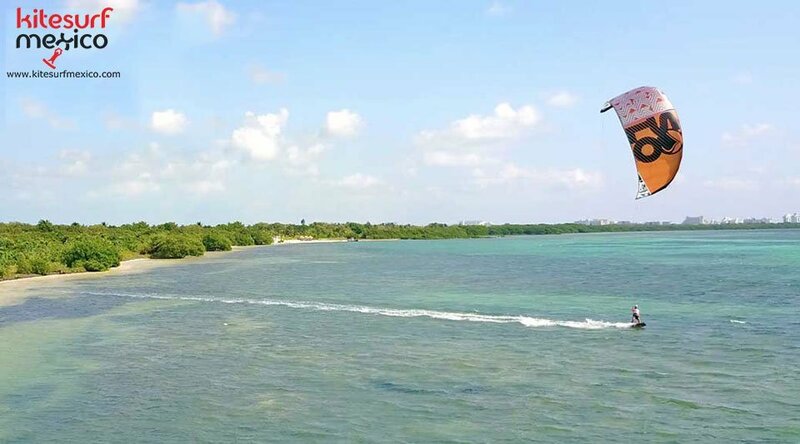 Playa Delfines is one of the best beaches in Cancun and, in order to reach it you have to go all the way down from the lookout, from where you can appreciate the wonderful turquoise blue, typical of this touristic destination. Once at Playa Delfines, you will be able to enjoy the Mexican side of the Caribbean Sea. Swell varies its intensity depending on the wind direction, although different extreme sports like surf can be practiced provided that the weather conditions allow for it.